Space Shuttle Lands, Ending 30-Year Era : The Two-Way The last NASA space shuttle mission into space has ended. Atlantis and its four crew members arrived at the Kennedy Space Center just before 6 a.m. ET. Space Shuttle Atlantis lands at Kennedy Space Center July 21, 2011 in Cape Canaveral, Florida. America's space shuttle program, which saw triumph and tragedy over its 30 years, came to an end this morning when Atlantis and its four-member crew touched down at the Kennedy Space Center in Florida after nearly 13 days in space. Atlantis landed in the pre-dawn dark just before 5:58 a.m. ET. We live-blogged as the shuttle came down. Scroll down and read "up" if you want to see how the story developed. As Atlantis rolled to a stop, NASA marked the end of the shuttle program with word that it had "fired the imagination of a generation." "Atlantis announces its arrival" with twin sonic booms, NASA reports. NASA TV now has an image of Atlantis on its approach. Update at 5:50 a.m. ET. Two Minutes "Late?" It looks like touchdown will be around 5:58 a.m. ET, NASA says. That's after 200 Earth orbits this mission. Atlantis just crossed over Florida near the city of Naples on the Gulf Coast. Update at 5:42 a.m. ET. Less Than 15 Minutes To Landing. NASA says that "Atlantis is encountering a plasma of super-heated air as it moves through the thickening atmosphere." The shuttle's "plasma trail" has been spotted by the crew high above in the International Space Station, NASA adds. NPR's Mark Stencel writes that "NASA TV reports that large crowds have gathered to watch the landing on a large outdoor TV screen in front of the administration building at the Johnson Space Center in Hosuton. There are not many places near the runway at the Kennedy Space Center in the Florida for the public to get a view of the pre-dawn landing, but the orbiter's tell-tale double sonic boom will rattle windows and rouse sleepers across the state." Atlantis should cover the remaining 2,300 miles to the Space Center in about 21 minutes, NASA says. With about 25 minutes to go before its scheduled landing, Atlantis is just west of Central America. The space agency has again enlisted enthusiastic fans to follow — and add their reporting — on Twitter. Follow #NASAtweetup to see what they're saying. And if you use Google Earth, you can track Atlantis here. The Associated Press reminds us that this is "the 135th flight in shuttle history. This grand finale comes 50 years to the day that Gus Grissom became the second American in space, aboard Liberty Bell 7." Here's a look at the approach Atlantis is set to take, across Central America and to the west of Cuba, as it heads toward the Space Center. At the Space Center, skies are clear and there's 10 miles of visibility, NASA says. Conditions are "perfect." Atlantis will pass over Central America and just to the west of Cuba as it heads toward the Space Center. According to NASA, "Atlantis has slowed its speed to lower itself from orbit and descend into the atmosphere for a landing at Kennedy at 5:56 a.m. It is still moving faster than 17,000 mph, but that speed will drop dramatically as the shuttle encounters the thickening air." Update at 4:55 a.m. ET: The "de-orbit burn" is complete. NASA says Atlantis is now committed to a landing in about one hour. Space shuttle Atlantis has just started a three-minute "de-orbit burn" and is beginning its descent into Earth's atmosphere. It's coming home after NASA's last shuttle mission into space. 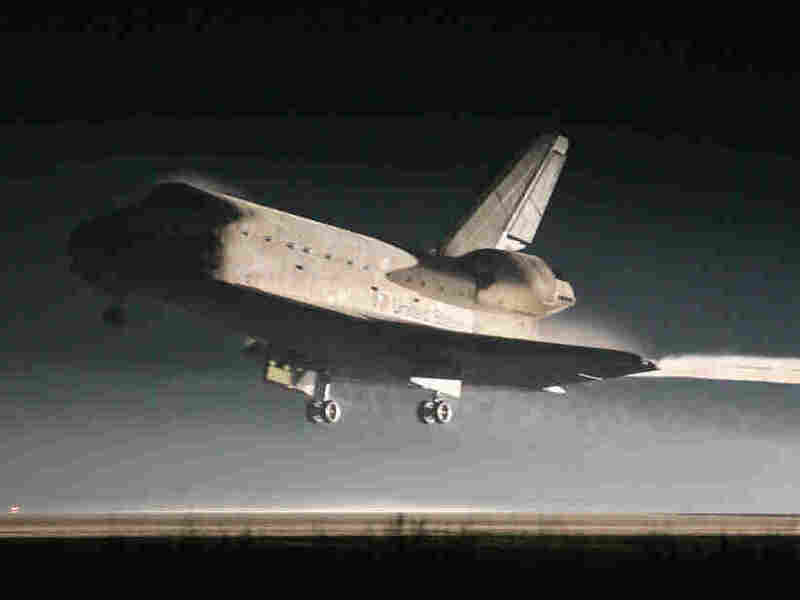 The shuttle and its four-member crew are due to land at the Kennedy Space Center in Florida at 5:56 a.m. ET. They've been in space nearly 13 days. We'll update this post as things happen. Be sure to hit your "refresh" button to see our latest additions. NASA's live coverage of the mission is here. The space agency's shuttle landing blog is here. For a look at NASA's post-shuttle future, see this Morning Edition story from NPR's Nell Greenfieldboyce. There's a graphic about the 30-year shuttle program and its astronauts here.